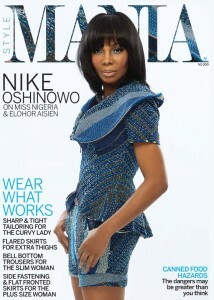 The editors of Mania Magazine have released the latest cover – for their August 2012 ‘Body Issue’ – and showing off a body to die for is style icon and beauty entrepreneur, Nike Oshinowo. Oshionowo speaks in the interview about leaving her job as coordinator of Miss Nigeria, and shares her opinions on the new director, Elohor Aisen. We can’t wait to read that! Away from the whiff of controversy, the issue “also offers great tips on body conscious trends for all body types. The fashion editorials feature the music sensation Iyanya and super model, Ojy Okpe,” said the editor and stylist, Dimeji Alara. The cover is photographed by Kelechi Amadi-Obi, with make-up and hair by Bimpe Onakoya and Ugo Igbokwe.